Download the data I used to make this! 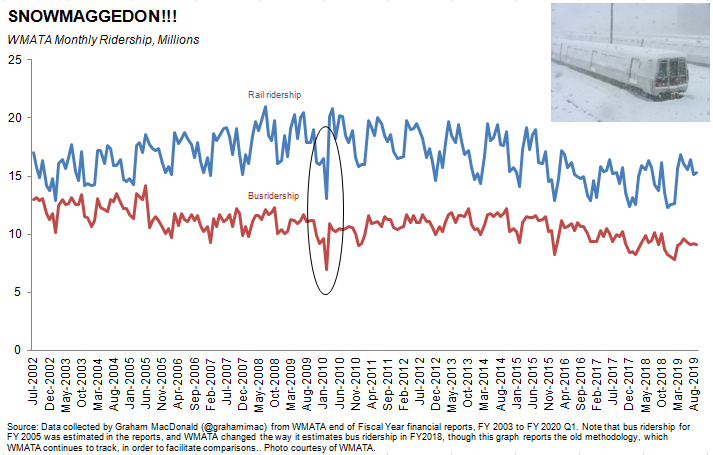 My wife recently told me about a Greater Greater Washington article on Metro's declining ridership, and being a big fan of "GGWash", as we call it, I went over and took a look. It was a great article (and I recommend you read it), but I wanted more historical context, so I went digging to find past ridership data. Such data was, of course, difficult to find in digitized format, so I went back through past WMATA financial reports and hand coded the PDFs' line charts into excel data, which I've documented and am making available for download above in case you're as much of a transit nerd as I am! Admittedly, I am not a metro expert (though I ride it regularly, and have for many years), so there are surely many pieces of context I left off this graph that are crucial. I hope others with more expertise can use the data and build on it, and tell a richer story here, as I would really like to better understand why these trends are occuring! 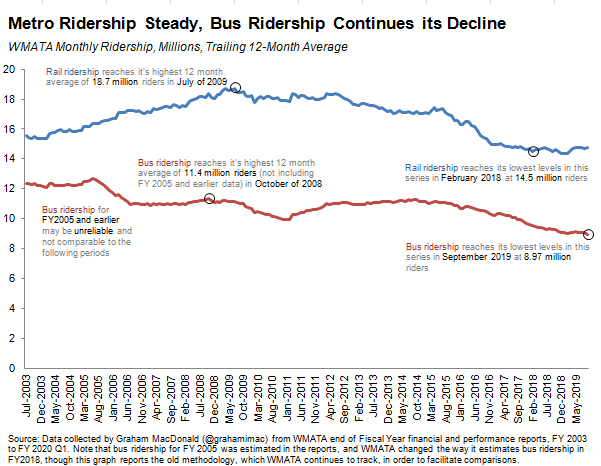 That said, the most interesting thing I discovered was that Metro's rail and bus ridership declines are almost completely explained by the past 3 years, preceeded by 6-7 years of mostly flat figures, on average. There are a number of interesting explanations, explored in the comments section of the article I linked to above, and I hope these data help to support or re-think those.